Silver Arts India touches the heights of creativity and excellence in the design and manufacture of Silver Jewelry and Gems Stones. Operating from India, as a manufacturer and exporter of silver jewelry and gem stones, the organization promises to deliver the most exquisite products at economical prices. A renowned company dealing in the wholesale export of all types of precious & semi-precious stones, gems and silver jewelry. Silver Arts India:- Manufacturer, Exporter & Supplier of Silver beaded jewelry & Gem Stones that are a statement of your personality. Our enticing list of beaded jewelry is made of different materials like glass beads, wooden beads, bone beads, horn beads, metal beads and countless others. These dazzling imitation jewelry are famous for their extraordinary looks and long lasting luster. 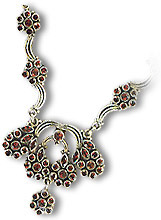 The Silver Pendants comprises of the spectacular designs and ethnic beauty. The glistening gold collection is inspired by the glory of the sun. The vibrant colors of the special luster used in this collection reflects the hues of the season. Silver Ear rings studs are the perfect gift for her! Our Silver earrings makes every woman look more radiant. From simple to trendy, our collection of exquisite Silver earrings offers many styles at great prices. The Silver Rings you have been dreaming of! Romantic and feminine, these vintage-inspired rings recall the charm of a bygone era. The Silver ring signifies the strength, success and independence of the women of the twenty-first century. Our sterling range of rings features brilliant quality and elegant settings. Silver's pure white color flatters all skin tones. Silver Necklaces is in vogue because it is inexpensive, casual and comfortable and at the same time, elegant and classic. It is the preffered choice of today's woman on the move. We have a mesmerizing collection of silver Necklaces to adore you. Traditionally beads have been an integral part of Indian fashion. Beads find their place in the rustic jewellery & attire of a village-belle as also in sleek & trendy ensemble i.e. varying from ethnic and traditional to contemporary and futuristic. The Silver Bracelets never fails- the way it attracts people to it,is somewhat phenomenal. Amassing Silver is a passion that we never get tired of . The bright sparkling Silver Bracelets are enough to set any woman's pulse racing and never fails to catch people's fancy. 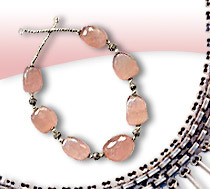 Silver Beads are some of the most stunningly attractive and varied items of jewelry. We offer premium quality sterling silver beads, sterling silver findings and other Indian beads at prices you will love. Silver chains is forever! The women cannot be ignored any longer.... the newest and latest trend is the Silver chains sets. These sets come in variety of beautiful designs Romantic, Floral, Contemporary and Vintage offering each women a design that best suits her individual personality!We offer you an enticing range of chains with in captivating designs to suit your exquisite taste. Bharampuri Khurra, Jaipur (Raj.) India.